So who here is making a turkey for Thanksgiving and How do you cook it? I have a utility grade ($0.97 a lb at No Frills) 13 pound turkey thawing in my basement fridge. I will be smoking it with Hickory chunks in my propane smoker tomorrow - I smother it in Sonny's BBQ sauce. Last edited by plymouthhater on Oct 7th, 2017 12:48 pm, edited 1 time in total. The boring way - put in a pan and bake for hours, basting periodically. My wife is cooking 11lb. turkey, right now. The regular oven method. Mine is a PC Butter Basted with 2 Stuffings, apple/bread in the chest cavity and sausage in the neck. It's cook from frozen so takes a long time at 325. Going to oven roast it tomorrow but eat on Monday. It was $1.49 at Independent. Making cheese/sour cream mashed potatoes, mashed maple/lemon/chipotle sweet potatoes, broccoli bacon salad, crunchy marinated vegetables, and apple pies. I use a dry rub, then use chef ramsay's recipe for his Christmas turkey, using the oven. The sauce is to die for. I got a fresh butterball.. its going into the smoker (traeger) using apple and cherry pellets. Making stuffing with apple, sausage, sage, in the oven.. with the usual trimmings, bought fresh from the farm a week ago... yams, brussels sprouts, mashed potatoes, gravy, cranberry sauce. Today I'm making an apple tart for dessert. Interesting you are using hickory, I find it a little strong for turkey. BBQ sauce? I'm going to oil mine and season with salt/pepper/garlic. I tried mesquite once - found it gave the turkey a bit of a sour taste - hickory seems to be fine - reminds me of southern US BBQ. 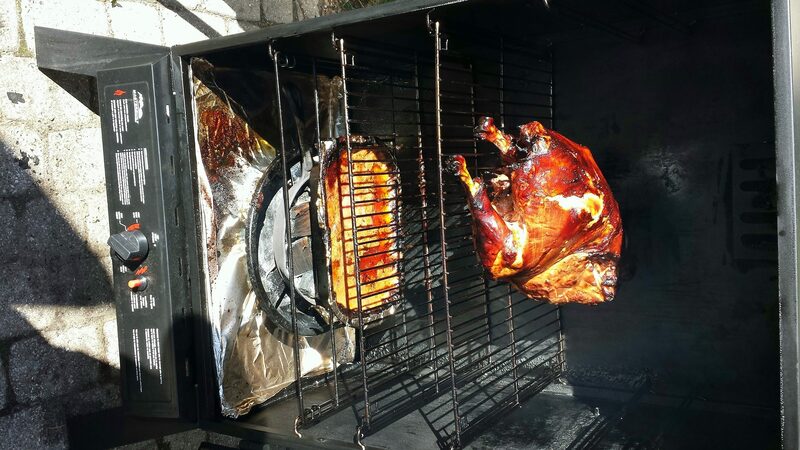 My oven went wonky a few days ago and I'm not chancing it...the plan is to cook the 14 lb turkey in the bbq. Hope it works. Thanks for the reminder. I've done that before, think I'll do it tomorrow. Yum!!! And we were already planning to have bacon gravy with it. Everything is better with bacon. Brining a 4.5kg PC Butter-Basted Turkey now. Not sure if that is even needed with the said-butter baste but will be smoking it with a bacon layer in the kettle. Good idea for the stuffings, keep the ideas coming. Hoping to preserve some gravy goodness in a bottom pan but will probably dry out. Brining butterballs and related variations is overkill and will make the texture more suited for seniors at a care-facility. What a waste. You might as well just have bought a utility turkey and brined it instead. I've been using Chef John's recipe ever since it came out and it's always a hit at parties. I also use it on chicken for weekend dinners. It takes about 1-2hrs to carve it out nicely, but end result is amazing. I'm going to a Chinese bbq place and getting some soy chicken and bbq pork.